"We can state one thing: taking into account that ISIL, Al-Qaeda, and Al-Nusra are not sitting in Damascus -- this is likely the main positive outcome of the support that our air force provided to the legitimate Armed Forces of Syria." Amid growing accusations that it is deliberating targeting civilians and aid groups, Moscow has defended its air strikes in Syria, claiming they have kept the extremist groups Islamic State, Al-Qaeda, and Al-Nusra Front out of the capital, Damascus. "This is likely the main positive outcome of the support that our air force provided to the legitimate Armed Forces of Syria,” Kremlin spokesman Dmitry Peskov was quoted as saying by the Russian daily Vedomosti on September 30. The first inaccuracy in Peskov's statement is that the extremist group Islamic state (IS) is not even located near Damascus. 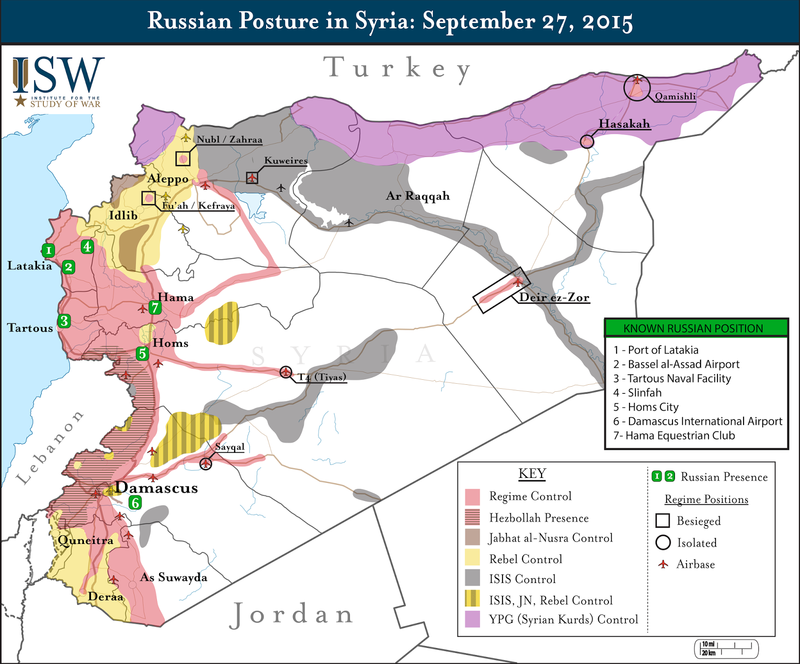 Even at the start of Russia's air campaign in September 2015, an analysis of IS's military positions done by The Institute For The Study Of War (ISW) makes it clear that IS was never positioned to take control of the capital. Its closest military position is more than 35 kilometers southeast of the center of Damascus, and that position is extremely small and relatively weak. Furthermore, very few Russian air strikes have targeted sites near Damascus. ISW has extensively studied and mapped Russian air strikes since the start of their air campaign, and there have been very few Russian air strikes against the Damascus region over that period of time. Additionally, there have been even fewer air strikes against IS-controlled territory, and according to ISW there has not been a single Russian air strike against IS positions southeast of Damascus since October 2015. Moreover, a close analysis of Russia's air campaign shows that almost no Russian air strikes have hit areas controlled by IS in any region of Syria. In fact, Russian air strikes have, at various times, targeted Western-vetted groups that were fighting against IS, allowing the extremist group to gain territory. While some Russian air strikes have targeted territory controlled by Jabhat Fatah al-Sham (formerly known as Al-Nusra Front), moderate groups with no Al-Qaeda affiliation have often been the target of Russia's bombing, as have civilians, hospitals, and non-governmental aid groups. Most recently, on September 19, a Russian drone continuously monitored a UN aid convoy until it was hit by an air strike which killed 19 civilians and 12 aid workers. An expert with the United Nations has confirmed that the convoy was destroyed by an airstrike. On October 5, Doctors without Borders declared that Russia and Syria were repeatedly bombing hospitals across northern Syria. The air strikes against civilian targets and emergency workers are one reason why the United States and Russia have ceased cooperation in Syria, a joint effort which was intended to help both countries fight terrorism. The London-based Syrian Observatory for Human Rights in September estimated Russia’s bombing campaign in Syria has killed more than 9,364 people, including 3,804 civilians.